Gates explains why it makes sense to replace thermostats along with the water pump. It is good garage practice to change the water pump as part of a scheduled drive system maintenance programme. This makes sense whether the water pump is driven by the timing belt or the accessory belt. In most workshops, however, thermostats are not normally replaced as part of either a scheduled timing belt maintenance programme or an accessory belt replacement. After removing a water pump, the cooling system should always be flushed to expel all potential contaminants, whether chemical or physical debris. Failure to flush the cooling system could lead to premature water pump failure. As the thermostat would prevent the whole of the system being flushed, it should be removed. It is good garage practice to fit a new thermostat and gasket after the system has been flushed, rather than risk refitting the old ones. The location of the thermostat can also be a critical issue. For example, in certain VW Group models fitted with V6 engines, the thermostat is seated directly behind the timing belt drive. Typical applications include Audi A4, A6 and A8. 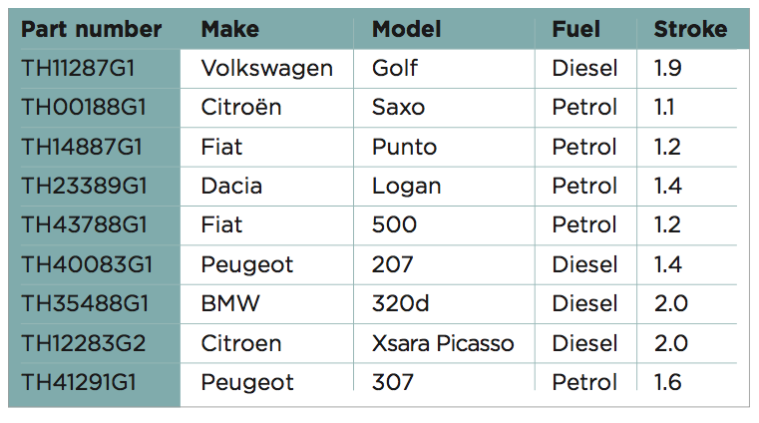 The Vauxhall Astra, Corsa and Meriva 1.6 petrol four cylinder engines have a similar design. In both the VW and the Vauxhall/Opel examples quoted, the timing belt must be removed before the thermostat can be replaced. If the thermostat fails and the timing belt has to be removed before it is possible to gain access to it, changing the timing belt at the same time as the thermostat becomes the most appropriate solution. Re-installing components from the previous layout risks premature drive system failure, warns Gates. This is because the ‘installation tension’ of the timing belt is a critical measurement that cannot be reproduced. As new belts are never reliable partners for older tensioners and idlers, new belts should always be fitted alongside new tensioners and idlers. After considering the problems associated with parts identification and system compatibility, Gates devised a simple solution that benefits both installers and their local motor factor. The Gates PowerGrip Kit Plus Water Pump Plus Thermostat range means that it is possible to order all of the matching parts and to receive them in a single box, all at the same time. It should be noted that such kits for Subaru Impreza, Forester and Legacy also include a Gates spacer tool that resolves other fitting issues that had previously caused premature drive system failures on these models. Each of these is an example of a practical and cost-effective solution for installers, with an emphasis on improving workshop efficiency and increasing installer protection. This is because there is a Gates part number for each of the vehicles mentioned so far and because all of the parts inside the box are covered by the same Gates warranty. previous overheating, corrosion or age. It blocks the circulation of coolant in the engine. It’s this that causes the radiator to overheat, which could be disastrous. ‘Fail-safe’ thermostats fail in the ‘open’ position and cause the engine to overcool. This creates problems such as a slow warm-up cycle, poor heater performance in the cabin, increased engine emissions and reduced fuel economy. The effects of an ‘open’ failure are undesirable, however they are far less catastrophic than those of a ‘closed’ failure. 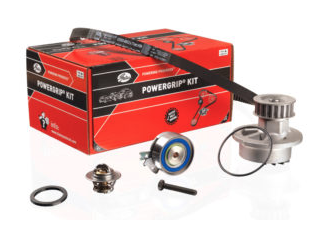 In many cases, it makes more sense to replace thermostats while the timing belt is stripped down and in these cases, the Gates PowerGrip Kit Plus Water Pump Plus Thermostat range makes things easier. All components match OE specifications, are ideal for each application and all fall under the same Gates warranty.